On Sunday 23 June 2019, starting from the Back O'Bennachie Car Park near Oyne, you will follow a set route up Bennachie to Mither Tap (518m). At 12noon all participants will gather below the Mither Tap summit. 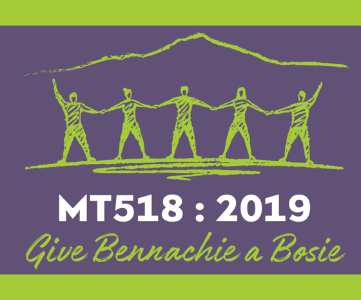 Working cooperatively, we want to be able to gather 400 people together to form a complete human chain around the summit of Mither Tap (Mother’s Breast) and give Bennachie its biggest bosie ever! This event aims to celebrate our Mither Tap and raise funds and support for breast cancer awareness and research charities as well as Aberdeen Mountain Rescue Team. Kintore Pipe Band will be playing on the actual summit as the bosie commences. We will photograph and film the event using a drone. The route starts at Back O'Bennachie car park (AB52 6RH or NJ 661 246), and you will climb Bennachie to Mither Tap. Once the bosie is complete you can return to the Back O'Bennachie car park. The total route is approximately 5 miles. Depending on fitness the whole walk will take about 4 hours (2 hours each way). Participants need to be at Mither tap for 12.00 noon to take part in the bosie. Sign in for the event opens at Back O’Bennachie car park near Oyne from 9am where you will receive your t shirt and additional safety information. Please make sure you give yourself plenty of time so that you are at Mither Tap for 12noon for the bosie. Can I Register On The Day? If we reach the target number of 400 participant, there will be no entries on the day, so please enter now to avoid disappointment! If we don’t reach the limit check out our Facebook page to see if we will be taking entries on the day but this will be £20 cash for adults and we cannot guarantee a t shirt. Sorry, due to safety reasons, we would ask that you leave your dog at home. All participants need to be at Mither Tap for 12.00 noon – Marshals at the top will direct participants on where to stand to form the circle of people which will be just below the Mither Tap summit. Marshals will be along the route and will be stationed at various junctions plus there will be signage on site. Marshals will have access to radios and mobile phones so do contact them if you have any difficulties. Marshals will be dressed in high-viz jackets. Marshals will be on the hill until 3pm. At Back O Bennachie Car Park (AB52 6RH or NJ 661 246) in field next to main car park and will be free for participants. Please try and share transport as there will be limited space for parking. Provided by Aberdeen Mountain Rescue Team. At approximately 12.30pm the playing of Auld Lang Syne will signify the finish of the ‘Big Bosie’. After the bosie, have a picnic and or participants can leave Mither Tap and head back to Back O Bennachie car park. At Back O’Bennachie refreshments will be on sale including tea, coffee, pizza, ice cream and cakes. Marshals will be on the hill until 3pm. By registering for the event, you are deemed to have given your consent for the publication of photographs of the bosie. Please bring your own snacks and drinks for your walk up the hill. Refreshments will be on sale at Back O’ Bennachie car park from about 1pm onwards until 5 pm and include tea, coffee, pizza , ice cream and cakes. Hot drinks will be on sale in the morning at registration. All money raised from your registration fee and donations, after costs, will be divided between Breast Cancer Care, University of Aberdeen Development Trust and Aberdeen Mountain Rescue Team. This event is organised by The Bailies of Bennachie. All participants must carry wind and waterproof jackets and take plenty of water and food. Suitable footwear for rough terrain should be worn. Make sure you take sun cream, sun hat, midge repellant and and blister care. If the weather is very bad or if due to unforeseen circumstances the event has to be cancelled we will email participants and also please check Bailies of Bennachie Facebook page for event updates. If the event is cancelled, which we hope is very unlikely, we will not be able to refund participants but money will still go to the charities. We would be very grateful if you could make every effort to car share since there will likely be pressure on parking spaces. If you come across an emergency please ensure that the emergency services are contacted straight away on 999. Following the call to emergency services please inform our event organiser. The number for the event organiser is 07923491116. We will also give you this information on the day. If you are feeling unwell in any way while you are on the walk please let a marshal know along the route or contact the event organiser tel 07923491116. Be prepared to manage your own minor blister care by taking with you plasters and not wearing new footwear. Make sure you take plenty of water. It is important to fuel your body with foods that contain high quality calories that will give you the energy you need. If your body runs out of fuel you may begin to have symptoms of low blood sugar such as disorientation, headaches and weakness. If you notice any of these symptoms, it is important you rest and start drinking and eating immediately. If your symptoms persist let a marshal know. Any participant under the influence of drugs or alcohol will be dismissed from the event. Please take all your rubbish home! Participants must be physically fit and competent walkers. Children under 15 years must be accompanied by a responsible adult. Equipment – as per section on equipment in general information above. Alcohol consumption - any participant under the influence of drugs or alcohol will be dismissed from the event. By registering for the Event, you are deemed to have given your consent for the publication of such photographs. For more news please see our current News, News 2019 and Events sections.